On 28 January, a middle-aged man entered the building of Moldova’s anti-corruption prosecutor’s office and asked a member of staff if he could take a dump. Upon refusal, he went out to his car, took out a toilet bowl and an object reminiscent of faeces, placed the toilet at the entrance of the institution with the fake faeces next to it, and sat on the bowl mimicking the act of defecating. 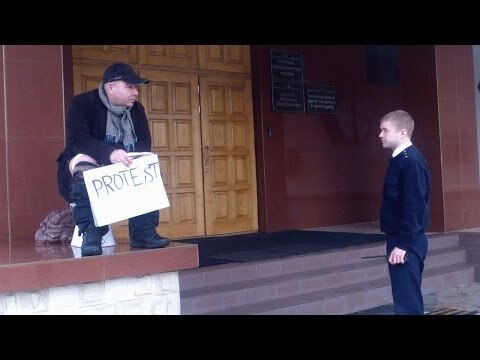 He held a sign with the words PROTEST. The following day, seven men dressed in civilian clothes showed up at the man’s house and, without any explanation, handcuffed him and took him to the police station. The alleged hooligan is Anatol Matasaru, an artist who is very upset with corruption, lawlessness and hypocrisy in his home country. For years, Matasaru has been using artistic means to question the practices of Moldovan state institutions. These daring artistic gestures have made Matasaru a household figure in Moldova. He is either loved or hated — but certainly not ignored. The police and prosecutors, whose practices are often abusive according to Matasaru, are a favorite target of his. Now freed, Matasaru faces charges of hooliganism, with prosecutors calling for a maximum sentence of five years. 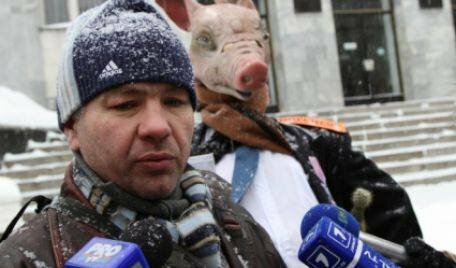 In 2014, one day after the national prosecutors’ day, Matasaru brought a human-size pig-like figure in front of the general prosecutors’ offce. The pig held a banner saying “Spit on me, I am corrupted”. Matasaru called the prosecutors — procurori in Romanian — porcurori (from porc, meaning pig in Romanian), a pun which caught on among his sympathisers. On that same day, Matasaru had with him a coffin as well: a hand sticking out the middle finger protruding from it — a symbol of anger over the deaths of innocent people in Chișinău in 2009 during protests against the Communist Party. “From the coffin, the innocent dead young people say... hello from the other side to the corrupted prosecutors,” said the artist. 2014: Matasaru and his prosecutor pig. Credit: curaj.tv. Matasaru explained that the coffin was meant to remind the public of the killing of anti-communist protesters in 2009, murders which many in Moldova say were committed by the police and which have never been investigated, as well as of the 2013 killing of a young father during a hunting accident in which hunters were the prosecutor general and other Moldovan dignitaries. “I am trying to set an example for people, to show them they can protest, that the law allows them to do so,” said Matasaru. January 2016: Solidarity action after Matasaru's arrest, Chișinău. Credit: Viorica Tataru. Clearly, then, Moldova's prosecutors lack artistic sensitivity. In addition to his current charges for hooliganism, Matasaru is already serving a suspended two-year sentence for hooliganism following another artistic protest in 2013. Matasaru’s politics are simple. A participant in the 2009 anti-communist protests, the artist claims to have been beaten by the police, who were serving the Moldovan Communist Party. Since 2009, with the Communists out of power and various democratic alliances succeeding in government, Matasaru has kept up his criticism of authorities, arguing that the same people – “people with vicious habits,” to use the artist’s words – hold power in Moldova. Matasaru’s latest charges may come as a surprise to some European observers of Moldova. After all, the country is now ruled by a government which calls itself democratic and pro-European and which was appointed following massive anti-corruption protests last year. 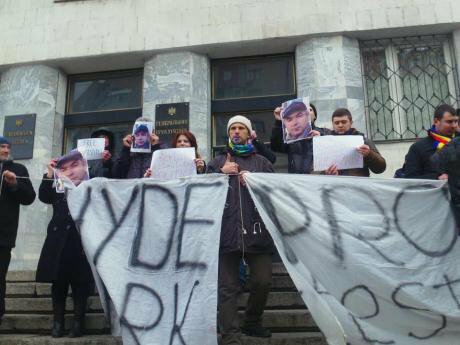 Those protests were sparked by the infamous stealing of one billion US dollars from Moldovan public coffers by as of yet unidentified people (the former prime minister was detained in connection to the case). Matasaru is not the only one in Moldova to point out that too many of the same people are still in power to expect drastic change. His continued harrassment by prosecutors is certainly not a sign of positive change in Moldova. The artist first made international headlines in 2008, when he was arrested and fined under the Communists for a similar artistic gesture, dressing a pig as a prosecutor and a donkey as a policeman. Back then, the democratic opposition condemned his arrest. The democrats in government today are less bothered by Matasaru’s legal troubles. Moldova’s new government should make sure artists in the country get to express themselves freely, even uncomfortable ones like Matasaru.